I saw the skies! I saw the skies! No shame and no veils! Here Comes the soul restless. I saw snow! I saw snow! Perhaps Art permeates the depths of the artist’s soul when he closes his eyes. At that moment his spirit wanders. There is a clash between the real world, that of discouragement, of melancholy and roughness; and the world of pleasure and delight that only in the dream is known. Perhaps Pure Art is born at this moment, free from the real life matters and the storms that insist on marging our souls. Only pure Art takes the spirit to delirium, to a cliff of emotions or an ascendancy of impressions that are often hidden inside the soul. The artist is the one who finds a way to these secret places. The free spirit floats through these secret places and delights in emotions and rejoicing. Perhaps this is the greatest role of Art. The purest ideas may be in form or color; in realistic, surrealist or abstract representations and presents reality under the artist's eye. Abstract Art goes through these paths, beyond reality, It wanders through the soul's eye and the most intrinsic meanings. This form of expression modify the known world; floats freely through the fields of form and color, as if playing the notes of a song; as if resting on canvas its shapes and colors in their pure state. Here the colors emerge, mix, and fade like blooming petals of flowers, in an endless and interesting play. Within the context of Modern Art, since the beginning of the 20th Century, abstract Art took place and continued to these days, as a revolutionary style. Before World War, Abstractionism emerged in several countries, as a way of exploiting all the potentials of color and form, apart from reality. Important historical episodes marked the first half of the 20th Century. Europe saw the birth of the Communist Soviet Union; the world suffered with the World War I and II; the fall of the New York Stock Exchange, in 1929, led to the Great Depression. Among the changes of the period, European society counted on a large number of women in the labor market, replacing the men who were summoned for the war. The rigid family system that lasted for so many years changed and, even after the war, women continued working. The Art it has adapted to this new lifestyle and stand in advancing modernity. Fig. 1 – Rietveld Shroder House, Yaro Mir, Visit UNESCO by Yaromir. Fig. 2 – Rietveld Shroder House, Yaro Mir, Visit UNESCO by Yaromir. Fig. 3 – Rietveld Shroder House, @holandesando, Website: holandesando.com/casa-rietveld-schroder/. Modern was striding along and bringing innovations to Architecture, for the decade of 30. The most relevant changes were over the search for simplicity, functionality and a distancing of ornamentation. The geometry and abstractionism applied to Painting became of great interest in the interior decoration, with simple forms and straight lines. However, these new architectural models were only accessible to wealthy customers. The masses, Even before the World War II, tended to be more conservative. But the fact is that the incalculable destruction throughout Europe, during the wars, brought a necessity to build quality houses, quickly and efficiently. Architects still had the challenge of building housing for workers, offering them quality of life, with gardens and sunlight. 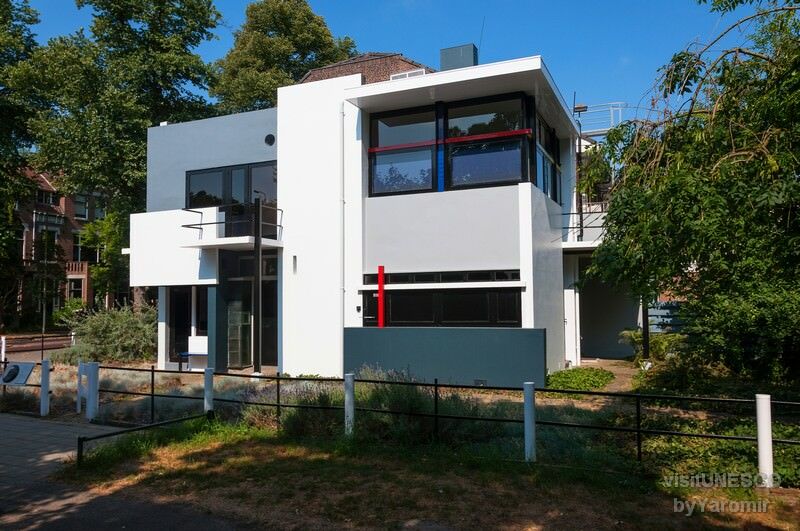 New conceptions about Design and Architecture were also widely disseminated by De Stijl (The Style), founded in 1917, by Theo van Doesburg (1833-1931); Piet Mondrian (1872-1944); and Georges Vantongerloo (1886-1965). The purpose of the magazine was to approach spiritual perfection and harmony in aesthetics; as well as promoting the use of new shapes and primary colors for everyday objects. 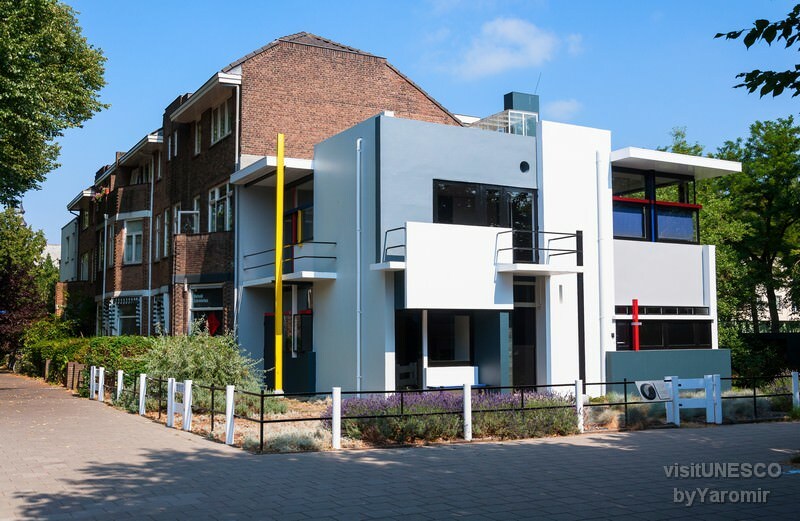 Dutch Architect and Designer Gerrit Rietveld (1888-1964), founded the International Congress of Modern Architecture, and became part of the De Stijl for which he wrote until 1928 and was the first to apply the magazine principles to his style. His concern was on the social, with an accessible form of production, standardized , that used new materials. 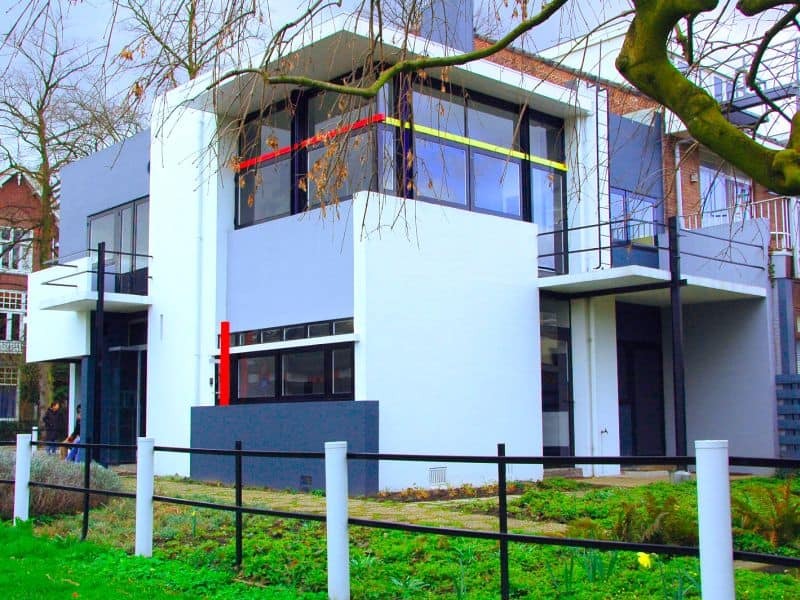 Example of easing domestic spaces is the Rietveld Schröder House 1 (Figures 1 and 2), of architect, built in 1924, in the city of Utrecht, Holland, according to the concepts of the movement De Stijl. The building, an icon of Modern Architecture, and received in 2000, status of World Heritage Site by UNESCO. Maybe the façade of the house reminds us initially of a Work of Art or a painting by Mondrian, with its straight lines, squares and overlapping rectangles, in gray and white, from which straight lines in black and red stand out. Mitigating the geometry of the construction, the plants seem to complement this fusion of colors, in a right measure. Like, a two floor cube, the house stands out, among the others of the street. While the exterior of the house resembles a work of Art, its interior is no different. The colors and the geometry are present in each room and it is possible to see the use of each space and corner, reasonable, in a right measure. Rietveld's best-known Work is the Red and Blue Chair, the “Red-Blue Chair” 2 currently exhibited at MoMA, in New York City. The decorative object proposes the use of straight shapes, lines and colors also in the furniture. With blue seat and red back, the chair structure and arms are made of fine wooden beams painted in black. The sensible use of bright blue and red contrasts with the seriousness of the structural lines, which in a way accentuates the connection with modernity and with Art. In Vienna, between 1919 and 1933, were built 66.000 houses, under the direction of architect Karl Ehn (1884-1959). They were small, built in suburbs with gardens, of models brought from England. With bolder proposals, the Dutch cities of Amsterdam and Rotterdam also joined mass housing programs. In the field of Architecture it is still important to remember the concept of simplification and few details, of the works of Ludwig Mies van der Rohe (1886-1969); the concerns with the light of Le Corbusier (1887-1965); or the functionality of the works of Walter Gropius (1883-1969), founder of the Bauhaus 3 and pioneer of Modern Architecture. The greater external dissimilarity becomes the greatest similarity. Fig. 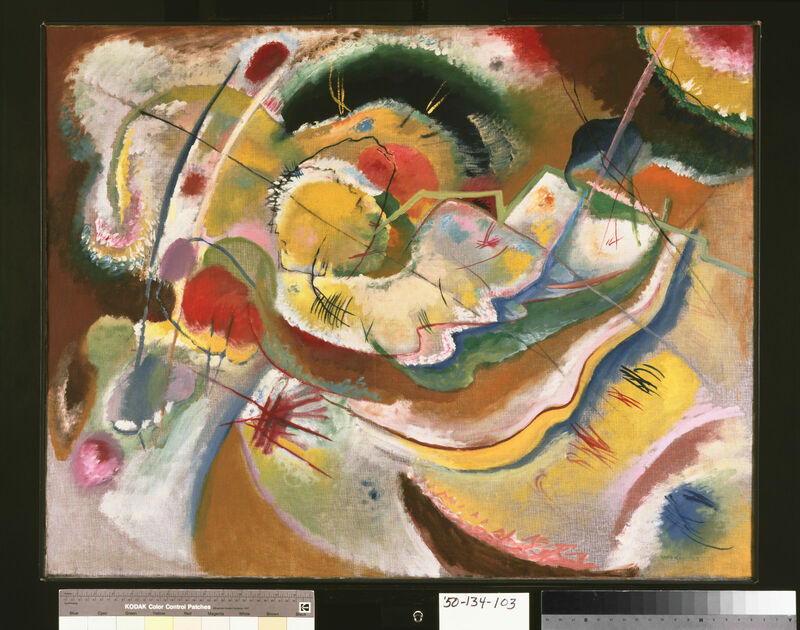 4 – Vasily Kandinsky, Little Painting with Yellow (Improvisation), 1914, oil on canvas, 31 x 39 5/8 inches (78.7 x 100.6 cm) Framed: 32 3/4 x 41 1/2 x 2 1/2 inches (83.2 x 105.4 x 6.4 cm). Philadelphia Museum of Art, The Louise and Walter Arensberg Collection, 1950-134-103. Fig. 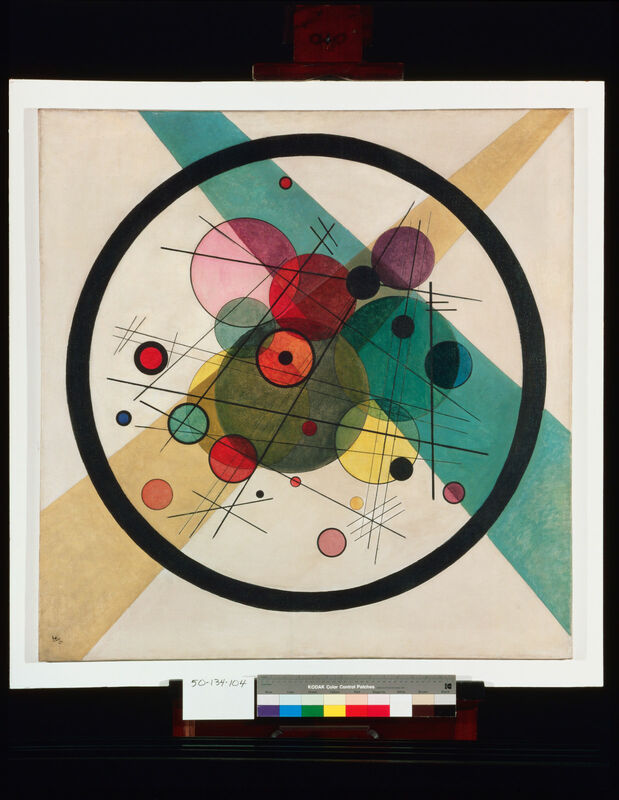 5 – Vasily Kandinsky, Circles in a Circle, 1923, oil on canvas, 38 7/8 x 37 5/8 inches (98.7 x 95.6 cm) Framed: 44 1/4 × 43 1/8 × 2 3/4 inches (112.4 × 109.5 × 7 cm). Philadelphia Museum of Art, The Louise and Walter Arensberg Collection, 1950-134-104. Fig. 6 – Vasily Kandinsky, Postcard No. 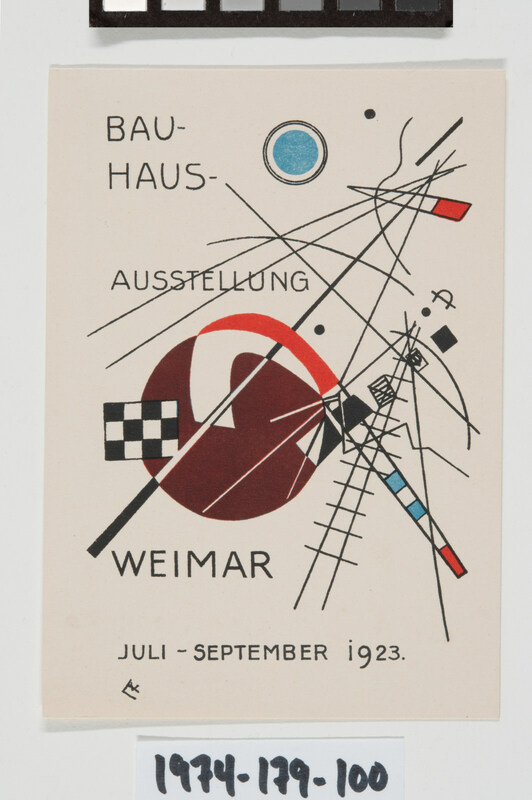 3, for the Bauhaus Exhibition, Weimar, July-September 1923, Color lithograph, Image: 5 3/8 x 3 3/4 inches (13.7 x 9.5 cm) Sheet: 5 15/16 x 4 1/4 inches (15.1 x 10.8 cm). Philadelphia Museum of Art, Gift of Carl Zigrosser, 1974-179-100. A great freedom, unlimited to the eyes of some, allows us to hear the voice of the spirit, which manifests in things with a particular force, which will use gradually, and already use all the spiritual realms as their instruments (…). The distance from realism was the main trace of Abstract Aesthetics. In the field of Sculpture, limitless and freedom were still associated with simplicity of lines, rationalism, organic forms and the use of differentiated materials. They were among the big names of the time, the sculptors Constantin Brancusi (1876-1957), Henry Moore (1898-1986) and Jorge Oteiza 4 (1908-2003). With works in several countries, British Henry Moore works produced in large and were influenced by several aspects of Modern Art, of the early 20th Century and by Constantin Brancusi. Moore's abstractionism received realistic introspection, modified by distortions, as if the images were organic, open, with movements, gestures and ripples. The lightness of his work came from the inspiration in the forms of nature and the care with the adaptation to the environment in which they were inserted. His style was imprinted on his Reclining Figures 5, known by the outlined the bodies, without details. The works seem silent, with slow strokes, as if resting on some imaginary surface. Autodidact (self taught), Jorge Oteiza (1908-2003) began in Sculpture, under the influence of Expressionism, but his style acquired abstract form in the 50, after contacting the work of Henry Moore. The inspiration in the abstract painters led Oteiza to the idea of emptying the geometric forms. His series of "Empty Boxes" emerged in this context, during the years 1957 and 1958. Among the artist's awards, one was at the São Paulo Biennial, in 1957. Maintaining the rigor of the volume, the artist outlined the known forms, to their outer lines, as if they were hollow. The manchands and sculptores popularization came with the occupation of public areas, like squares and sidewalks, such as decorative element similar to what happened in the Renaissance. Fig. 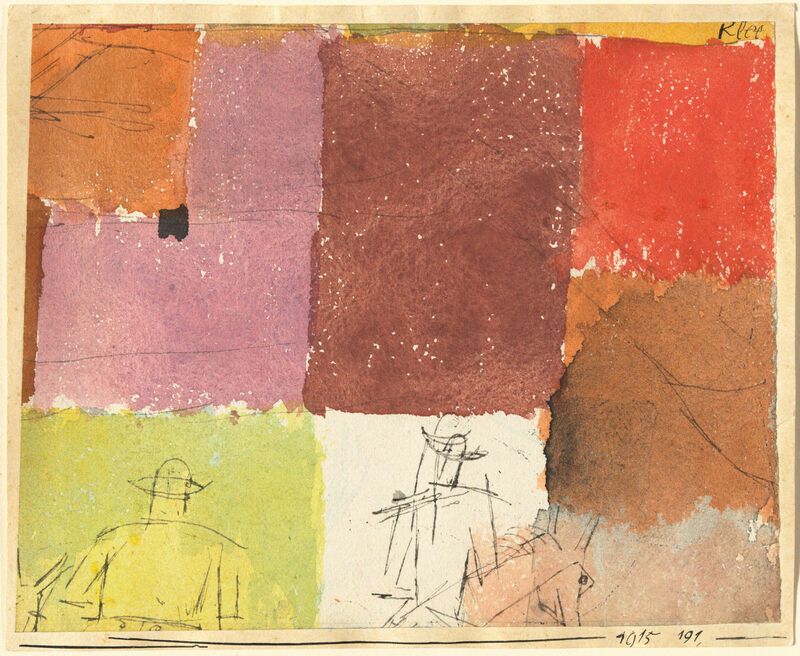 7 – Paul Klee, Composition with Figures, 1915, Pen and ink and watercolor on paper mounted on card stock , Sheet: 10.16 × 12.7 cm (4 × 5 in.) mount: 10.8 × 13.02 cm (4 1/4 × 5 1/8 in.). National Gallery of Art, Washington. Collection of Mr. and Mrs. Paul Mellon. Fig. 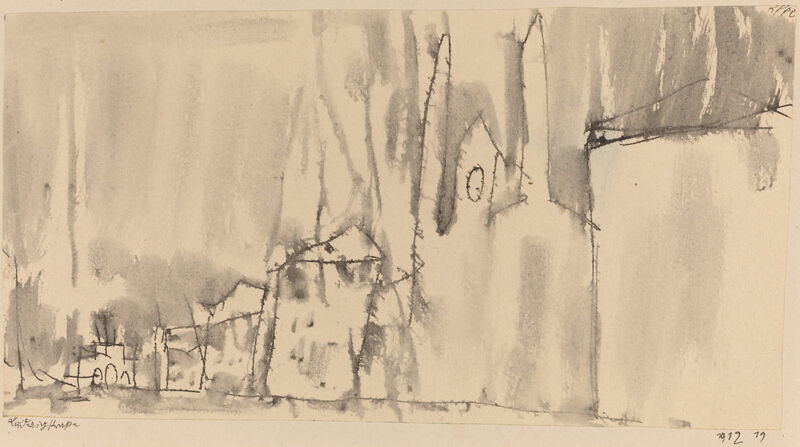 8 – Paul Klee, Ludwigstrasse, 1912, Pen and black ink with wash on cream paper, laid on cardboard, overall: 9.9 x 19 cm (3 7/8 x 7 1/2 in.). National Gallery of Art, Washington. Gift of Benjamin and Lillian Hertzberg. The blue, the Blue rose, rose and fell. The pointed, the thin hissed and became intruder, but did not pierce it. In every corner the thing resounded. Nothing is more intoxicating than the moment when the work is generated. Such enthusiasm is noticeable in the quote from Kandinsky (1866-1944) and shows that, besides Painting, the artist was also skilled with words. His Works revealed a strong connection with Music, from which came much of his inspiration. For Kandinsky the colors and the movement of a work were linked to Music. Made melody to look, His paintings distanced themselves from the figurative as long as He demonstrated artistic consistency and maturation. And the field of abstraction was where Kandisky's Art-Music settled down. The idea of distancing reality had already been experienced by artists already in the late 19th Century, with the Fauvism and the Expressionism, consolidated with the Cubism, which opened doors to Abstract Art. Painting became a subjective representation of the artist's idea of things and the world. The first works emerged from 1910 and, up to the present day, Abstract Art defies the look, when turning to the interior and to the field of sensations. Still under the influence of Expressionism, in the first decades of the 20th Century, arose in Germany important movements that culminated in Abstract Art. Among them was The Bridge (Die Brücke), in 1905; and The Blue Knight (Der Blaue Reiter) in 1911, which was part Wassily Kandinsky (1866-1944), along with Alexej von Jawlensky (1864-1941, Franz Marc (1880-1916), August Macke (1887-1914), Paul Klee (1879-1940), and Marianne Von Werefkin (1860-1938). Under the influence of Expressionism and the group The Blue Knight, was born the yearning for an Art that approached the soul of the artist and the field of sensations. Lyrical or Informal, then erupted, influenced by Expressionism, Fauvism, with Kandinsky as its greatest representative. Strong inspiration in mathematical rigor and rationality of Cubism and Futurism, was also formed a second group, the Geometric Abstractionism. Following rational thought, the group branched out across the world in several strands, including Suprematism with Russian Kazimir Malevich (1879-1935); the Neoplasticism, linked to De Stijl, with Piet Mondrian (1872-1944) and Theo van Doesburg (1833-1931), in the Netherlands; the Constructivism, also in Russia; the Concretism, with Swiss Max Bill (1908-1994); and Neoconcretism, in Brazil, with Hélio Oiticica (1937-1980) and Lygia Clark (1920-1988). It is not difficult to connect Kandinsky's Art to Music. In figure 5, it is possible to perceive the sounds of the musical notes of a colorful orchestra, in the center of an imaginary stage. Illuminated by spotlights, the black lines intersect the space, curled in the colorful circles, translucent, which also transpose. The delicate scene seems to make noises, for every movement. It is understandable that his art approach a more internalized, spirit-oriented content, for in-depth understanding. With a smaller color palette, the postcard for the Bauhaus Exhibition (Fig. 6) also presents straight lines in counterpoint with colored circles. From its junctions, new forms emerge filled or empty, one juxtaposed to another. In its accommodation, the image acquires life and the sounds emanate from it like sinters aligned with time and movement. The green tones of nature fight for space in the town of Paul Klee (Fig. 10). One can recognize branches and treetops in the midst of the urban, as if the fields of color were in an arduous attempt to extend their wide arms. Its undefined shapes seem to squeeze on the white background. Even further from reality, the Suprematist movement explored pure geometric forms, as in Malevich's works 6. The logic in his work consisted in arranging circles, triangles, squares and rectangles in vivid colors, on white backgrounds. Often superimposed, at other times accommodated as a puzzle, the shapes fit coherently in the empty space, adjusted to it. It is quite probable that the soul of the artist penetrates each work and walks on it, pretending not to be there. Taciturn and self-absorbed, he adjusts the images to himself, in silence. The only sound heard is the beating of shapes in contact with colors. Fig. 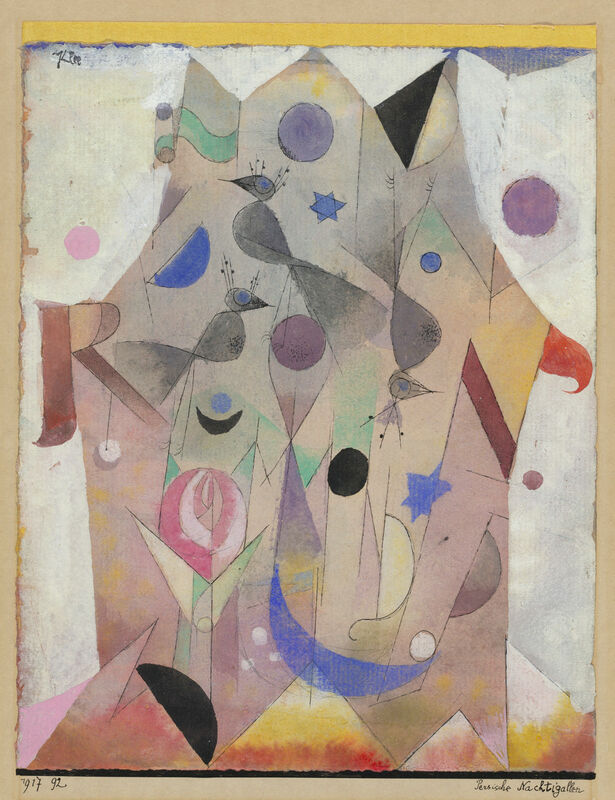 9 – Paul Klee, Persian Nightingales, 1917, Gouache, watercolor, and pen and black ink over graphite on laid paper, mounted on cardboard; the sheet bordered at the top with yellow paper strip mounted to support, overall: 22.8 x 18.1 cm (9 x 7 1/8 in.). National Gallery of Art, Washington. Gift of Catherine Gamble Curran and Family, in Honor of the 50th Anniversary of the National Gallery of Art . Fig. 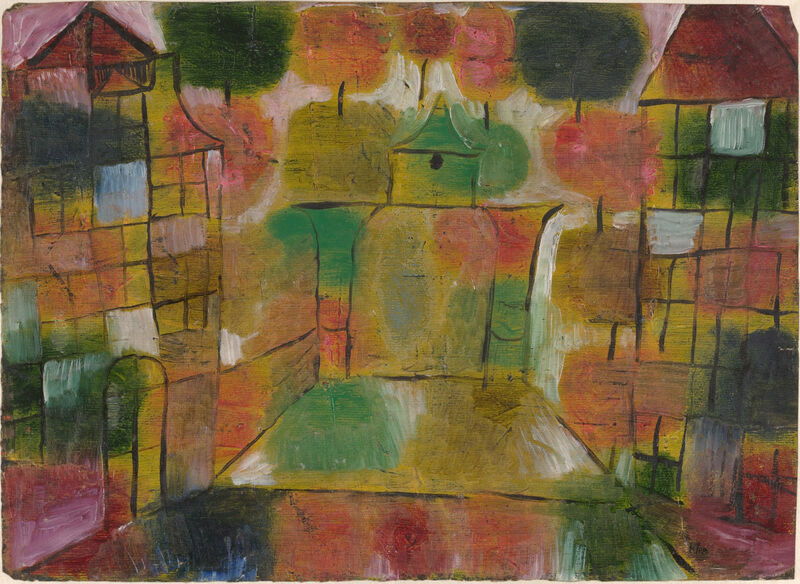 10 – Paul Klee, Tree and Architecture – Rhythms, 1920, Oil on paper, overall: 27.9 x 38.3 cm (11 x 15 1/16 in.). National Gallery of Art, Washington. Gift of Benjamin and Lillian Hertzberg. Freedom expresses itself as an effort of the spirit to free itself from the forms which have already fulfilled their role – from ancient forms – and to create from them, new, infinitely diverse forms. On the fruitful canvas, the autonomy of the artist allowed himself to behave and to dispose the purest, in the field of Art. He worked with colors and forms in an emancipated, mature and intelligent way, as never before. Creativity took over the available space, allowed itself to speak, reassembling what was most beautiful in his spirit. The intense enthusiasm that triggered at that moment allowed the Art to take its own character. For Kandinsky, "greater external dissimulation becomes the greatest internal resemblance" (p. 125, 1991). The result of such freedom, inner search is the exploration of new fields, is to travel by indefinite directions, and, especially travel where only the spirit determine, between colors that are born and fading; that emerge and that if shed flirty, sometimes retreating, sometimes advancing, in a fun game that never ends. Art must be pure; the soul of the one who explores must be pure to feel delighted by the Art; and should be free taste. Delight happens when the screen space becomes inviting and insinuating. This is where Art speaks by itself, detached from the inhuman reality and transits to new directions. It is possible that at this moment one can feel the same emotions the artist felt in the intense enthusiasm for his creation. Enjoying Art is permeating the work, seeing the inner world that printed, is to smell it, taste it and hear the sounds that echoes. On stage, Dark blue dusk, at first whitish, after a deep dark blue. After some time, one begins to see in the middle of the stage, a small light, that becomes more alive when the blue darkens. After some time, music in the orchestra. Break. Behind the stage you begin to hear a chorus arranged so that you can not locate the place from which the song comes. The bass voices are mostly heard. The corner is regular, with interruptions indicated by points. BANDEIRA, Manuel. Bandeira de Bolso, Uma Antologia Poética. Porto Alegre: L&PM Pocket, 2008. BYSTRINA, Ivan. Semiotics of Culture Topics, Classrooms Yvan Bystrina. PUC – SP,CISC (Center for Interdisciplinary Research in Semiotics of Culture and Media). São Paulo: PRE-PRINT. Translation Norval Baitello Júnior and Sonia B.Castino, 1995. CALVINO, Italo. Por que ler os clássicos. 2to. edition. São Paulo: Companhia das Letras, 1993. Tradução Nilson Moulin. GASSET, José Ortega y. The art of humanization. 5 to. Edition. São Paulo: Ed. Cortez, 2005. GLANCEY, Jonathan. A História da Arquitetura. São Paulo: Edições Loyola, 2012. GOLDING, John. Modern Art Concepts. Rio de Janeiro: Jorge Zahar Editor, 1991. KANDINSKY, Wassily. Olhar sobre o Passado. São Paulo: Livraria Martins Fontes Editora Ltda. 1991. KANT, Immanuel. O Belo e o Sublime. Pôrto: Livraria Educação Nacional Ltda. 1942. 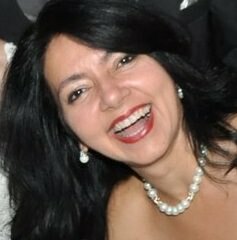 MEIRELES, Cecília. Espectros. São Paulo: Editora Global, 2013.